The company I co-founded, vivid, did conceptual work on the development of this website for Bank of America starting in 1994, including information design, architecture, technical consulting, and creative direction. This prototype was the beginning of a long relationship with the bank to transform its brand online and build appropriate new functionality that played to the Internet’s strenghts. The relationship was originally a partnership between Band of America’s online group, it’s advertising agency, Ketchum Communications, and my company, vivid studios. 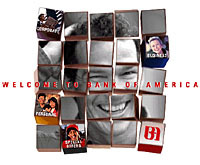 Together we explored ways in which the Bank of America brand could evolve in media such as kiosks, PDAs, and the Internet. The visual metaphor of using building blocks to express the brand concept of “Build Your Own Bank” became a successful approach for the bank and a new brand developed by Bank of America for their online banking needs. it wa originated by Tim Bruns and Lawrence Stout at Ketchum and we evolved it several times over the life of the website until it was purchased by Nations Bank in 1998. The concept was built on the idea that the site should be available to everyone at all times without the need for identification or passwords in the same way that people can enter a bank branch and find information. However, if people bothered to start an online account (for free) and identify themselves on the way into the site, the site could then serve pages and information in a personal, relevant way. For example, if a particular user didn’t have a house (and the system would know based on the information shared with the bank), then it should never bother them with special offers or information on second mortgages, etc. As the bank grew and the site’s functionality expanded, the homepage had to serve more functions, chiefly more marketing functions. We evolved the original design to make available all of the aspects of Bank of America’s business while quickly speeding people to the section that relates to them. It was also important to “humanize” the bank, play off of their current advertising appearance, and create a dialog or conversation with the audience.